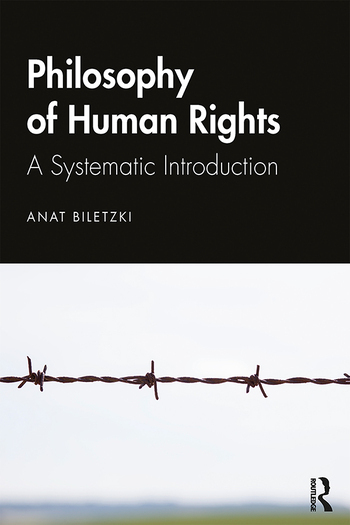 An introductory text to the philosophy of human rights, this book provides an innovative, systematic study of the concepts, ideas, and theories of human rights. It examines the principal philosophical issues that arise in specific areas of rights, such as women’s rights, minority rights, or disability rights, and addresses the human rights aspects of world problems such as global poverty and humanitarian intervention. Along with the presentation of these established subjects, the book provides a vibrant critique of both the liberal fundamentals of human rights and the legal and political aspects of the concrete practice by individuals and organizations. Offers a well organized overall structure, moving from historical treatment, to conceptual analysis, to a set of current issues, and finally to criticism. Anat Biletzki is the Albert Schweitzer Professor of Philosophy at Quinnipiac University in Hamden, Connecticut, and previously was Professor of Philosophy at Tel Aviv University. Her publications include Talking Wolves: Thomas Hobbes on the Language of Politics and the Politics of Language (1997), and (Over)Interpreting Wittgenstein (2003). She has been chairperson of B’Tselem - the Israeli Information Center for Human Rights in the Occupied Territories (2001-2006) and was nominated among the "1000 Women for the Nobel Peace Prize - 2005".